The what day? The CREAMIEST day! And (I hear you ask) why is today the creamiest day of the year? Because July 30 is Cheesecake Day. Yum! Yum! As I pulled into the shopping centre carpark this morning, my favourite radio announcer was giggling about today being Cheesecake Day. But I was so pleased he was because without his reminding me, I would never have known and would have gone about my day completely oblivious to the fact that today is the day to indulge in the decadence of this delicious dessert. So what does one decide to do on Cheesecake Day? Why one decides to make a cheesecake of course, and as I was heading into my local supermarket to buy some essentials, I just added a few extras to my list. I could have made any one of the many varieties I like to fuss over – Violet Crumble or Crunchie Cheesecake, Mars bar or Toblerone, Strawberry or mixed berry. Yes, I could easily have made any one of those or I could even have lashed out and made a White Chocolate Raspberry Cheesecake or a Red Velvet Cheesecake. No. I was not prepared to simply make any cheesecake. Oh no. 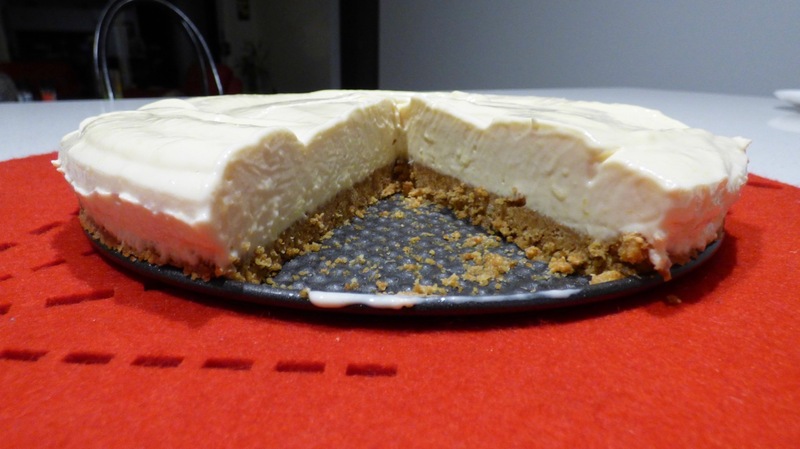 Cheesecake just so happens to be Deans favourite dessert, and if I was going to ‘whip one up’ it would have to be his favourite – my Lemon Cheesecake. This was a bigger than normal activity for me to undertake as it’s the first time I’ve ventured into cooking something other than a regular meat and three veg style dish since breaking my wrist back in February. I was sceptical as the whether or not I could complete this task unaided, and perhaps my own thoughts jinxed me, because, although I managed the operate the two kitchen appliances I used (one for crushing the biscuits, another for beating the cheese), I was unable to manage the lemons and called Dean in to help. There are still some actions I am not capable of doing, and even now, some five hours later, my wrist is still complaining. But it was well worth it and we have both just enjoyed a (generous) slice each. Yum! Yum! In my tum. I even updated my recipe file and you can download a printable version here or by visiting my Recipes page. Previous Post Previous post:Did You See That? I was going to ask how your wrist is doing. Over time it will get better and better. This cheesecake looks amazing! I might have to come on down for a slice! Any time Nancy. Any time.